31 InnovativeHealthMag.com coverage will be available to compensate you for your liability claim in the same way as if the at-fault driver had insurance. Although insurance companies are not required to offer uninsured motorist benefits, almost all of them do. This coverage is typically very inexpensive. Based on the foregoing, it is recommended that you purchase at least $500,000 single limit uninsured motorist benefit coverage. B. UNDERINSURED MOTORIST BENEFITS ARE RECOMMENDED Underinsured motorist benefits will protect you if you suffer serious personal injury or wrongful death as a result of the negligence of someone who does not have adequate liability insurance to fully compensate you for your loss. For example, if an at-fault driver runs a red light and causes you to suffer a permanent injury but the at-fault driver does not have enough liability coverage to fully compensate you for your damages, you can recover the difference between the at-fault driver’s liability coverage and your underinsured motorist coverage. In this situation, if the at-fault driver had the minimum $20,000 of liability coverage and you purchased $500,000 of underinsured motorist coverage, there would be an additional $480,000 of liability coverage available for your liability claim. In our opinion, underinsured motorist coverage is one of the most important insurance coverages you can buy to protect you and your family. Moreover, it is our experience that most serious auto accident injuries are, in fact, caused by people who do not have enough liability coverage to adequately compensate their victims. Therefore, the only way you can protect yourself against these unfortunate situations is by purchasing optional underinsured motorist benefits. Unfortunately, however, there are some insurance companies doing business in Michigan that do not sell underinsured motorist benefit coverage. Because we believe this particular coverage is so important, we recommend you seriously consider changing insurance companies if your company does not offer underinsured motorist coverage. As with uninsured motorist coverage, underinsured coverage is fairly inexpensive. Based on the foregoing, it is recommended that you purchase at least $500,000 single limit underinsured motorist benefit coverage. 5 INSURANCE POLICY DANGERS Unfortunately, there are certain dangers that consumers must watch for when purchasing their auto insurance coverage. Several are listed below. A. NEVER BUY A “STEP-DOWN” POLICY Some insurance companies sell auto insurance policies that contain very controversial provisions known as “step-downs.” These provisions apply most often when one family member (e.g., spouse, child, parent, sibling, etc.) pursues a tort liability claim under that policy against another family member with whom they live. Step-down provisions can also apply when the policy holder or a member of his or her family is injured while riding in a family vehicle driven by a non-family member. Step-down provisions are dangerous because they reduce the amount of liability insurance coverage available to the injured family member to the state-mandated minimum of $20,000, regardless of how much liability insurance was purchased by the policy holder or the severity of the injury. In other words, these provisions treat the policy holder and his or her family members more harshly than non-family members injured in the same accident. For example, suppose a parent owns a car insured with a $500,000 liability policy and is driving that car with both her child and a neighbor’s child in the back seat. Suppose further that the parent negligently causes a car accident, catastrophically injuring both children. If that parent’s auto insurance policy has a step-down provision, the liability claim of the parent’s child will be limited to only $20,000, whereas the neighbor’s child can pursue a liability claim up to $500,000. It should also be noted that in situations where step-down provisions apply, the injured family member will probably not be able to pick-up the difference through any underinsured motorist coverage the family may have purchased. This is because underinsured policies typically exclude from coverage any claims arising from the negligent operation of vehicles insured under the policy. Therefore, underinsured coverage cannot be used to overcome the harsh unfairness of family step-down provisions. Unfortunately, Michigan appellate courts have upheld the enforcement of stepdown provisions, even in catastrophic injury cases. Sadly, few people know that they have a step-down provision in their policy until it is too late. Therefore, Michigan motorists are strongly encouraged to never purchase auto insurance from insurance companies that insert step-down provisions in their policies. Remember: step-down policies are anti-family and the companies that sell them are not treating families fairly. B. CAUTION WHEN EXCLUDING CERTAIN DRIVERS Michigan law permits insurance companies to issue policies where certain drivers are “excluded.” An excluded driver is a person for whom there is no insurance coverage if that person’s driving results in an accident. 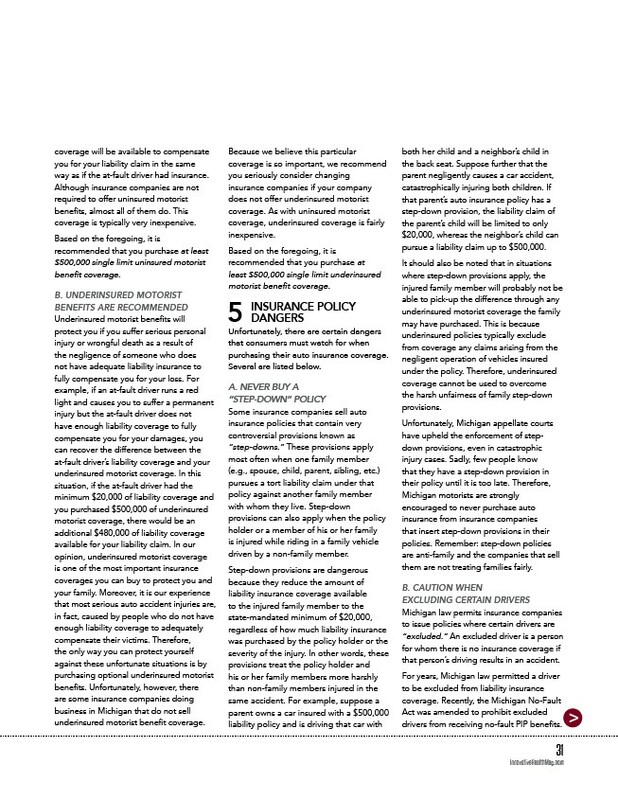 For years, Michigan law permitted a driver to be excluded from liability insurance coverage. Recently, the Michigan No-Fault Act was amended to prohibit excluded drivers from receiving no-fault PIP benefits.